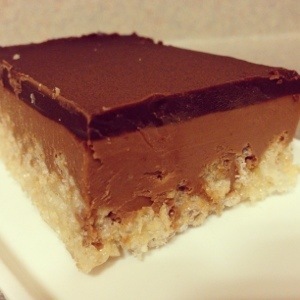 Do not leave your husband home alone with these peanut butter crispy bars. I first made these bars from the recipe posted by Smitten Kitchen. And then I immediately amazon primed the book via 2-day. This is a fabulous book and you should purchase it immediately. My previous go-to, impromptu, dessert for parties was cheesecake marbled brownies by Smitten Kitchen. But these are my new obsession. I use Ghirardelli semi sweet chocolate chips for this recipe to make it simple and I find the taste to be indistinguishable from using chocolate bars. The Lindt 70% smooth dark chocolate bar is great for the chocolate icing. Line the bottom and sides of an 8×8 square pan with nonstick aluminum foil. Grease the foil with butter. Measure the cereal into a large bowl. Pour 1/4 cup water into a small saucepan. Gently add the sugar and corn syrup (do not let any sugar or syrup get on the sides of the pan) and use a small wooden spoon to stir the mixture until just combined. Put a candy thermometer in the pan. Cook over medium-high heat and bring to a boil; cook until the mixture reaches the soft ball stage, 235 degrees F.
Remove from the heat, stir in the butter, and pour the mixture into the cereal. Mix quickly until the cereal is thoroughly coated, transfer into the prepared pan. Using your hands, press the mixture into the bottom of the pan. Let the crust cool to room temperature while you prepare the next layer. In a large nonreactive metal bowl, stir together the chocolate and the peanut butter. Set the bowl over a saucepan of simmering water and melt together, stirring with a rubber spatula, until the mixture is smooth. Remove the bowl from the pan and stir for about 30 seconds to cool. Pour the chocolate peanut butter mixture over the cooled crust. Put the pan in the refrigerator until the top layer hardens, approximately 1 hour. In a large nonreactive metal bowl, combine the dark chocolate, corn syrup, and butter. Set the bowl over a saucepan of simmering water and melt, stirring with a rubber spatula, until the mixture is completely smooth. Remove the bowl from the pan and stir for 30 seconds to cool slightly. Pour the mixture over the hardened milk chocolate peanut butter layer and spread into an even layer (just pick the pan up and move it around into an even layer). Put the pan into the refrigerator for 1 hour, or until the dark chocolate layer hardens. Cut into 9 squares and serve. The bars can be stored in the refrigerator, covered tightly, for up to 4 days. Adapted from Baked: New Frontiers in Baking , by Matt Lewis and Renato Poliafito published by Abrams Books via Smitten Kitchen. I spent my long call day at work today planning a baby shower that is two months away. But I am just so excited. I have the menu completely worked out. And these absolutely have to be on the menu. These cupcakes from Annie’s Eats were an instant hit for me because they taste so much like my wedding cupcakes. 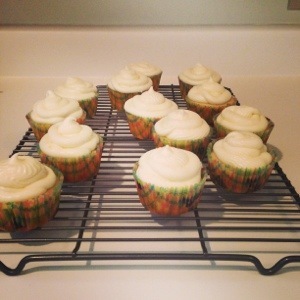 Jaume Serra Brut Cava pairs well with these cupcakes. This is an excellent budget sparking wine that is made in Spain from 3 grapes: Macabeo, Parellada, and Xarello. Macabeo is probably the most widely planted grape in Spain and is 50% of this wine. 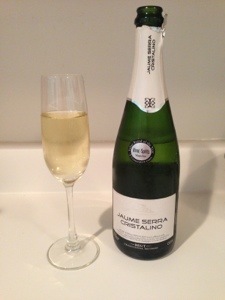 Parellada is more refined and gives this cava bright acidity. 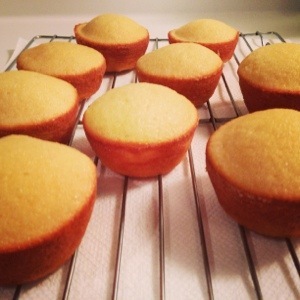 Preheat the oven to 350˚ F. Prepare cupcake pans with paper liners. In a medium bowl, combine the ¾ cup all-purpose flour, the cake flour, baking powder and salt; whisk together and set aside. 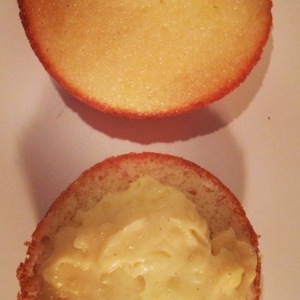 In the bowl of an electric mixer, combine the butter, sugar and lemon zest. Beat on medium-high speed until light and fluffy, 2-3 minutes. Beat in the eggs one at a time, blending well after each addition. Beat in the vanilla and lemon juice. With the mixer on low speed, mix in half of the dry ingredients just until incorporated. Blend in the milk. Mix in the remaining dry ingredients, beating just until incorporated. In a small bowl, toss the blueberries with the remaining 2 tablespoons of all-purpose flour. Using a spatula gently fold the berries into the cake batter. Divide the batter evenly between the prepared liners, filling each about ¾ full (I use a 4 tbsp scoop). Bake 20-22 minutes, or until a toothpick inserted in the center comes out clean. Allow them to cool in the pan for 5 minutes, then transfer to a wire rack to cool completely. To make the frosting, combine the cream cheese and butter in the bowl of an electric mixer. Beat on medium-high speed until well combined and smooth, about 2-3 minutes. Mix in the lemon juice and lemon zest. Gradually beat in the confectioners’ sugar until totally incorporated, increase the speed and then beat until smooth. Frost cooled cupcakes as desired. (I used a half inch diameter star tip to frost these but would use a large star in the future.) with fresh blueberries. Obviously the mini version of anything is more awesome than the original. 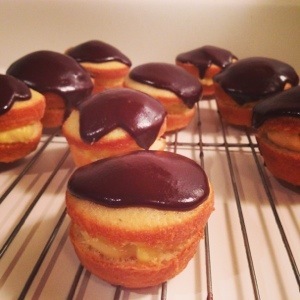 This is a fun and easy way to recreate Boston Cream Pie. 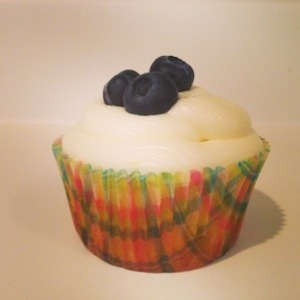 These cupcakes are also much more simple to serve than the full size version. I have upgraded the pastry cream here with some guidance from Thomas Keller in Bouchon Bakery. I would serve this dessert with your favorite variety of bubbles. This is comfort food in 60 minutes or less. I am not sure how I stumbled across this recipe but it has become an awesome stand by. 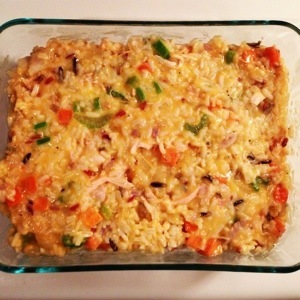 I have done some tweaking with it and this is no boring old chicken and rice. This is a wonderful way to use leftover chicken. 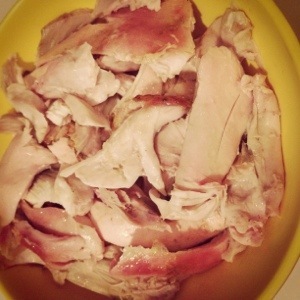 You can also leave out the chicken here and increase/add vegetables. I have also taken packages of Trader Joe’s mixed vegetables and thrown those in this dish. My husband got some pulled pork for lunch at our awesome local BBQ Trailor, B’s, and he picked up half of a smoked chicken as well which I used to make this. Merlot would go great with this, cutting through the cheddary goodness. Preheat oven to 350 degrees F. Heat oil in a large pot over medium heat. 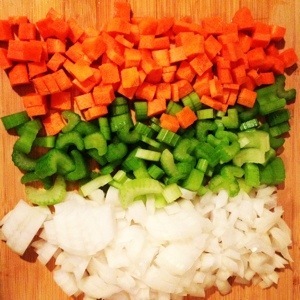 Saute onion, celery and carrots until softened, about 10 minutes. Cook garlic for one minute, stirring constantly. Stir in chicken, both rices, salt, pepper and garlic salt. Reduce heat to low. 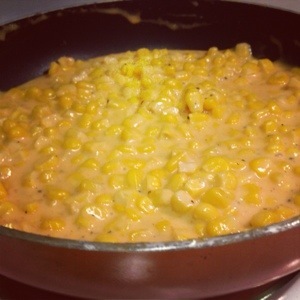 To prepare cheese sauce melt butter into a medium saucepan over medium high heat. Whisk in flour, salt and pepper then slowly pour in chicken broth whisking continuously. Whisk until thick and nearly boiling then stir in cheese until melted. Pour cheese sauce into rice mixture then transfer to a 8×8 inch baking dish. 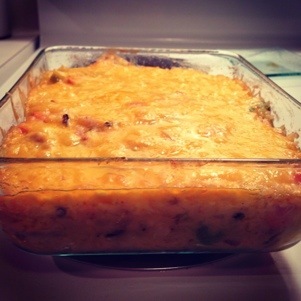 Top with additional cheddar cheese and bake for 25-30 minutes or until cheese is melted through.